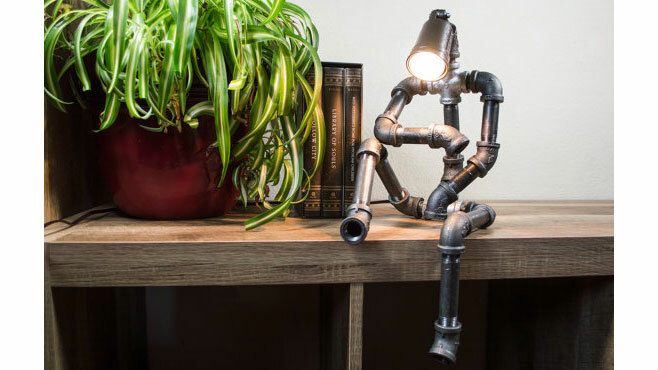 Robot lamp made from pipes is a super cool gift idea. There are many different models out there and you can even do it yourself (diy), but this one here is the coolest one I’ve found. 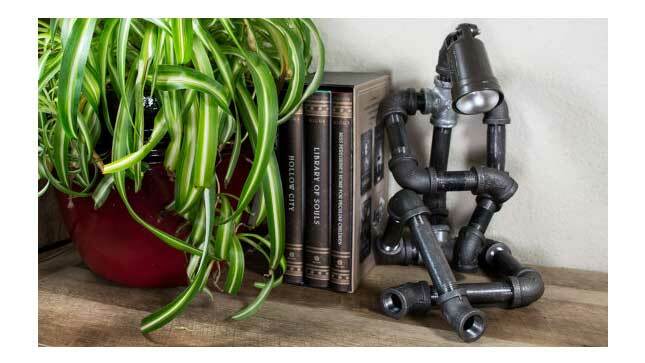 If you’re looking for a truly unique gift idea I think this robot pipe lamp is an awesome idea. I don’t think anyone can honestly say this lamp isn’t awesome. Each robot and handmade to order. It is made with ½ inch cast pipe fittings and utilizes a standard 120v plug type. The product can pose in two cool positions, which are both included in the instructions manual. The company that makes these lamps also say that custom requests are welcome, so on the products page you can request a message or something custom done. Product dimensions are 7 inches wide by 9 inches long by 12 inches tall. If comes with an LED lightbulb, so the will have everything they need to get the lamp operational and looking awesome. If you have questions about his pipe lamp robot feel free to drop them all in the comments and we will respond promptly! Thanks for visiting our website.